Well, Andre’ the Ricoh GR III and the old streetshooter have created a bond that appears to have longevity for the future. It took a few compromises but I am very comfy with the camera. I was doing a shoot in Northern Liberties here in Philadelphia and came upon Old Glory almost at rest. The wind was so soft as it swirled around me and I watched as it moved in and out of the folds of Old Glory. The clouds were forming and a few droplets of rain lay at rest on my face. I wanted to make a photo but I worried about Andre’ the Ricoh GR III cause he doesn’t like rain. Pity huh? 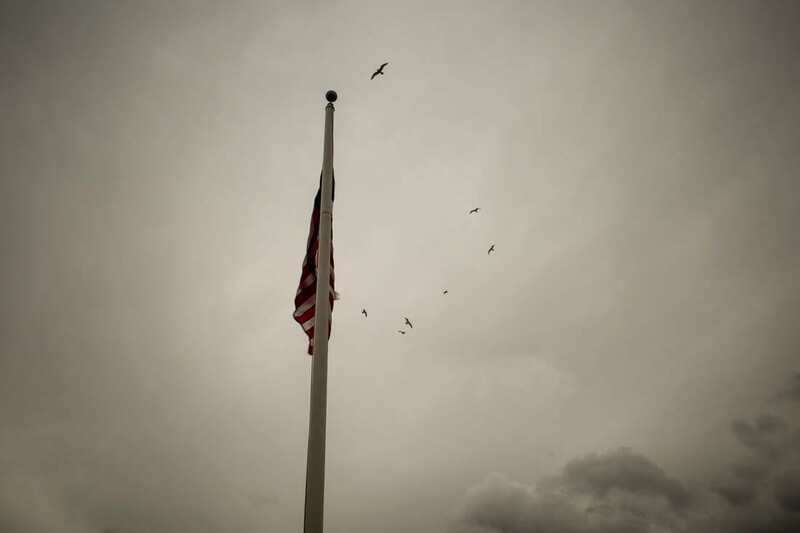 I looked at Old Glory and the empty space in the sky. The clouds were forming to bring the rain. I thought, there’s a possibility of a photo and just a possibility. Then a calm took over me and I started to feel that there is always a reason for everything. I thought about the political mess we have in our country. I thought about how many, many took pleasure in disrespecting Old Glory and her Front Runner, President Trump. I raised Andre’ and looked at the screen and then as if the angel of photography sent me the missing elements that even I could not know they were missing. I smiled and CLICK! By the time I lowered Andre’, the birds of the future past vanished into the oblivion of night. ……and our flag was still there. …..
Well captured and poignantly said! I think the birds are giving their own salute as they fly by. Thanks, Dave, I’m in a mood…..
Good one Don, in all respects. I’m always a sucker to photograph the flag too. Thanks, Alex, yeah…. I’m a sucker for a flag shot.